When I was an incoming freshman to SU, I searched tirelessly on the “Class of 2017” Facebook pages, trying to sell myself to potential roommates. Somewhat unsure exactly what type of a roommate I was looking for, I announced to the group that I was seeking “anyone who likes to have a good time but focuses on academics as well.” All I was sure of was that I wanted a roommate whom I was able to research on social media first before committing to live with them. I had heard a few roommate horror stories and did not want to sign up for the arbitrary roommate algorithm. However, as the deadline for roommate selection approached, I still was not able to find the right fit and even turned down several options. I took this as a sign that my roommate search was not meant to be, so I decided to just let the system determine my fate. I received my roommate assignment and was put in a quad, which meant I had three random roommates. This was a pleasant surprise because I was able to share a living room with my roommates in addition to two bedrooms in the space. Though I was pleased with the outcome of my dorm, I was still unsure about the roommates I was going to live with. My roommates came from different backgrounds and all different parts of the country. One of them was from Atlanta, another from New York City, and the third from Los Angeles. To my pleasant surprise, I made three new friends right off the bat. I learned about different parts of the country that I had never visited and gained insight into the different cultures of each person’s diverse background. While we were all a bit apprehensive at first, we soon started hanging out together more and more. We bonded over shared TV shows, made plans to go to the dining hall, and explored the campus together. I especially got along with one of my roommates, Adam, who is also from California. We found out that we actually shared some mutual friends and talked endlessly about our California roots. It was really nice to meet someone who understood exactly what I was going through as a West Coast native living on the other coast for the first time. We also branched out and got to know our whole floor, eventually becoming friends with everyone on floor five. 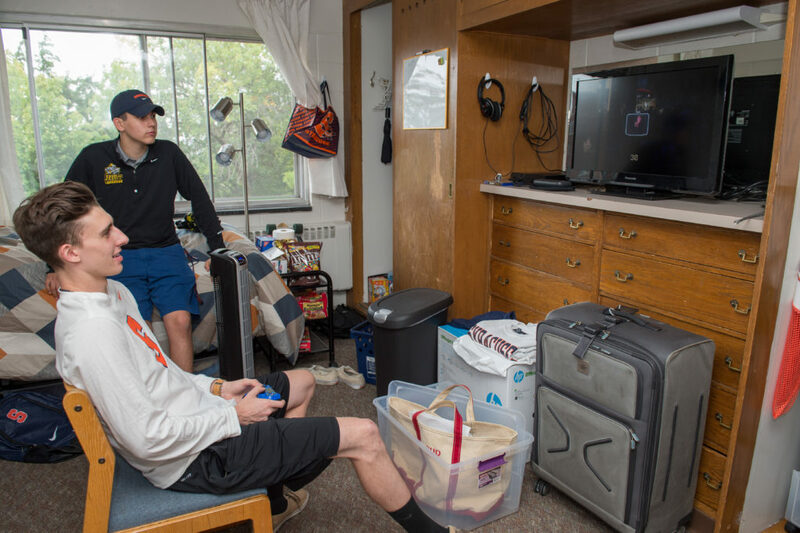 Brewster fifth floor became a really close-knit family and I finally felt that SU was my home away from home. That sense of belonging was something I had longed for and being able to experience it encouraged me and gave me the confidence I needed to make even more friends. Getting out of my comfort zone and looking at this as an opportunity to meet new people ended up being far better than playing it safe and picking my own roommate. Sure, random roommates can be a hit or miss situation, but you’ll be amazed how taking that chance is sure to be rewarding in the end.